I’ve made a resolution to stop buying new toys for a while and to finish off some of the projects I’ve not quite finished. 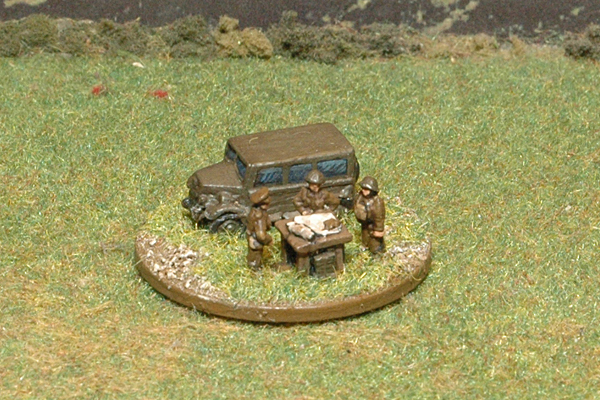 First up were my 1940 British who needed an HQ stand and a fourth company (12 stands) to complete a Battlegroup Panzergrenadier infantry battalion. Well that’s done and here’s the command stand. This HQ looks great. Which Pendraken codes did you use? The vehicle is the BR63 Humber staff car. The officer with the cap comes from BR142 BEF Officers and I think the ones in the helmets come from either BR149 BEF3″ mortar with crew or BR145 2lb AT gun with BEF crew. Thanks got the info Derek. Love the little table too. Is that scratch built?